It's a bumper year for the common cicada, Cyclochila australasiae. We've been hearing them calling since early October and now, during the current spell of hot weather, their song is quite deafening. This species is familiar to most people living in south-eastern Australia. They have many common names: Greengrocer, Yellow Monday, Masked Devil, Chocolate Soldier, Blue Moon ... and no doubt many more. Part of their fascination lies in their variability in colour. They can be green, yellow, orange or - rarely - blue. Some have black markings, like most of the ones we see here in the forest. It was the insightful comments made by a friend a few days ago that prompted me to read a bit more about Australian cicadas, and about this species in particular. The following information is drawn largely from an excellent book, Australian Cicadas, (M.S.Moulds, 1990) that synthesises much of the research into the biology, ecology and distribution of our local species. So, do they really have a seven-year life cycle? It turns out that no one is really sure and it's a particularly difficult research question. The observation that there are often 6 or 7 years between seasons like this one – when there are clearly more of the adults about than in 'normal' years – is the only real evidence. It is tempting to think that large numbers of adults, laying large numbers of eggs, means a large number of nymphs ... and if the lifecycle is shorter, why don't we see large numbers of adults emerging in other years? But this is a very difficult hypothesis to test. It is clear that some adults emerge each year. It is possible that the time spent as a nymph is highly variable. It may be that weather or other conditions have an influence on development time. No one really knows. The nymphs live in the soil, feeding on tree roots, so direct observation is not an option. Remember learning this as a child, mixing paints together? Well, it turns out that the cicadas (and many other green insects) use the same trick. They produce both yellow and turquoise pigments and it is the combination that makes them appear green. And this explains the various colours for which this species is renown. Some individuals make little or no turquoise, and so appear yellow. A very rare few make no yellow, and so appear blue. Neat, heh!? The black markings are produced by a different mechanism. Such 'melanism' is most commonly associated with animals that develop in cold climates. It is therefore not surprising that most of the orange-and-black 'Masked Devils' are found in mountainous areas or here in the southern part of their range. Cicadas are generally famous for their loud calls. And they really are loud! Cyclochila australasiae can produce nearly 120 decibels at close range. To put that in perspective: electric drill = 94dB; ambulance siren = 109dB; chain saw = 110dB. Fortunately, we are not usually standing so close when they are in full voice. The males typically call from high in the canopy. In our forests, they tend to be in tall eucalypts. Play Paul's video below to hear the calls (with a few bird calls thrown in!). Of course, the purpose of the song is to attract a mate. Only the males sing loudly. Their abdomens are largely air-filled, amplifying the sound that they make from the ridged 'tympanae' near their wings. Individuals are loud, but groups are even louder. And it turns out that the insects use this ploy in their own defence. By grouping together, the noise of their combined song deters predatory birds. Cyclochila australasiae only call when the temperature reaches 18.5 degrees C. This helps explain why they were calling late into the night a few days back, when the temperature didn't drop below 20. 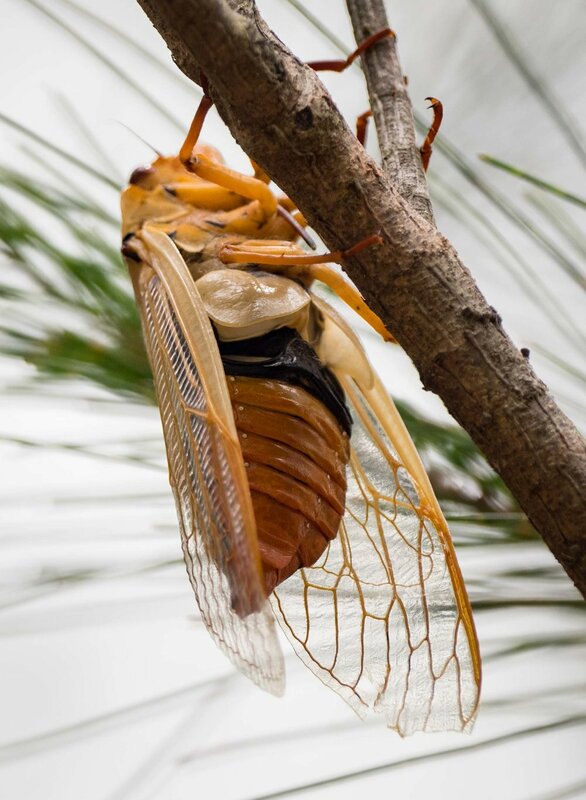 These cicadas typically appear during October, reaching their peak numbers in November and early December. Most will have died by late December. They can live up to 6 weeks, but most will not be that lucky. The abundance of tasty cicadas this year must be a boon for the Sacred Kingfishers. It might also prove to be a bonus for the small skinks, distracting the hungry birds which in most seasons also consume large numbers of lizards. The cicadas are quite a beak-full for the kingfishers. The birds typically seize their catch from among the foliage and then fly elsewhere before working on it – probably as a way of escaping the noise! They beat the insect against the perch, and generally work it over with their powerful beaks. The series of images below show the extent of processing needed before the prey is fit as baby food. Moments after these shots, the bird carried the meal to its nest hollow, high in an Angophora tree. Finally, I can't resist adding this footnote. The Sacred Kingfishers have taken a liking to bathing in the frog pond. Yesterday morning I was taking a few shots of the soggy bird through the window of the house, but then decided to step outside for a better view. In the 40 seconds between my last shot of the kingfisher and then refocusing on the same rock ... look who turned up! The snake made a very brief tour of the wet rock before returning to its hiding place under a pond-side log.